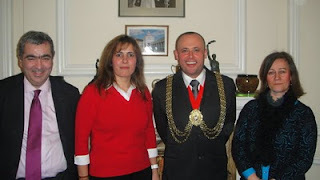 The Mayor of Lambeth, Cllr Christopher Wellbelove held a reception on Tuesday night to honour community representatives from the Portuguese and Spanish speaking communities, including representatives from Portugal, Madeira, Latin America and Africa. Around 100 guests attended from across Lambeth and the rest of the capital to discuss how the diverse communities who speak Portuguese and Spanish can best be represented in Lambeth. Discussions included plans for a new Portuguese community centre, which Lambeth has allocated £0.5 million to fund and will be established by community leaders. Afro-caribean community or any community at all.